1. Pick a date and location. 3. Send out a save the date email or message. Things tend to get crazy busy from Thanksgiving on and I want to make sure my guests have the exchange on their calendars. I decided that my cookie exchange will alwasy be the first Sunday in December. 3. A month before the event, send out an invitation. I do an Evite because I ask guests to share the cookie they are making in their response. That way everyone can see what others are bringing, which will hopefully prevent duplicate recipes. You also need to decide on the rules for the swap. 1. Bring one dozen of your favorite cookies on a platter, ready to share. 2. 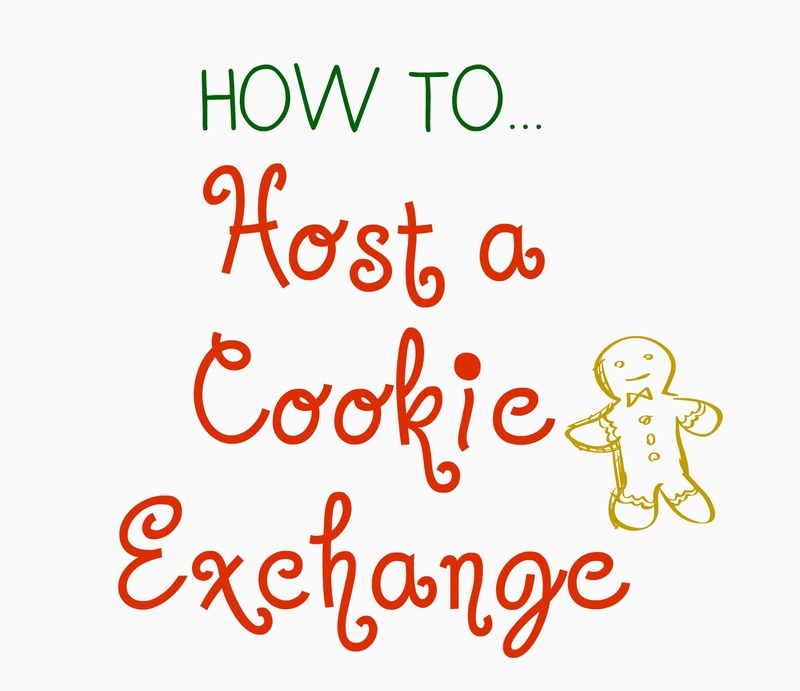 Bring three dozen of your favorite cookies packaged in groups of 6, for you to swap. 3. Email me your recipe by November 27th. I'll create a book of all the recipes for you to leave with. 4. Tell us what kind of cookie you're making in the reply section, so there aren't duplicates. 4. Plan the party. What will you serve? 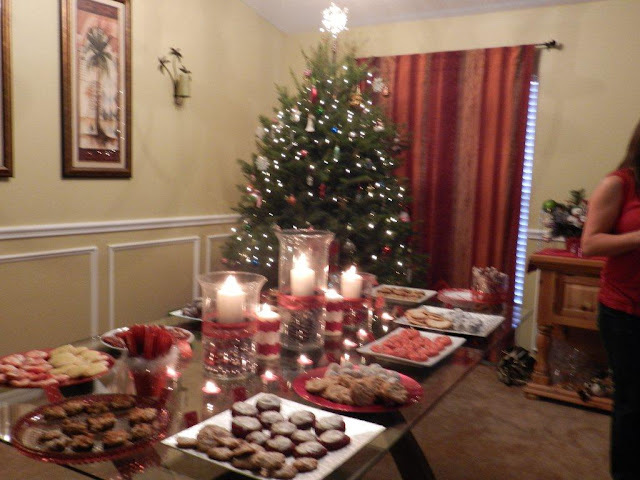 I usually keep it simple because guests will eating lots of cookies. I make a few appetizers. This apple pie dip is always a hit and these brie bites were delicious as well. As for drinks, I make one festive alcoholic, Shirley temple, egg nog and water. I always make sure to have extra wine on hand just incase. Then, I make extra sweets that people can snack on. This included chocolate covered pretzels, M&M pretzels and bowls of candy. Since your guests will be eating lots of cookies, keep the other food light. 5. Buy decorations. If you know you're planning on hosting a cookie exchange each year stock up on decorations after Christmas the year before. If you're looking for decorations for that year, check out the dollar store, the dollar section at Target and Oriental Trading always has a great things for a good price. 6. Create a ballot for guests to vote on which cookie was the most unique, best tasting, most appealing and best packaging. 7. Compile all the recipe the guests send you into a recipe book. I printed them out and gave them to my guest to leave with. 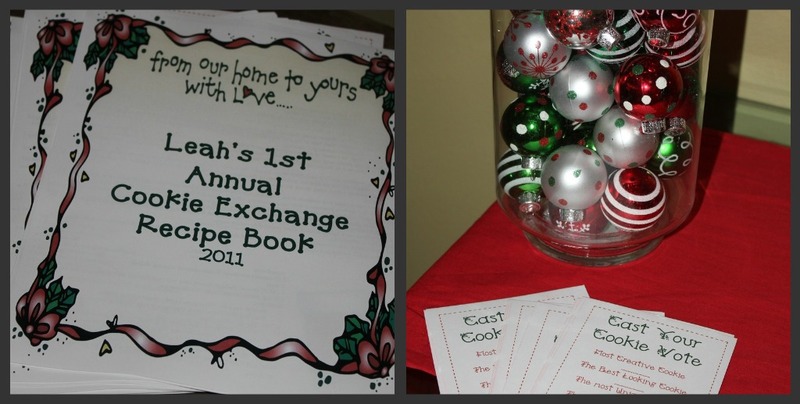 You could also make a book and email it out to the guests to save on printing costs. I just wanted my guests to have the recipes of their favorite cookies from the day. 8. 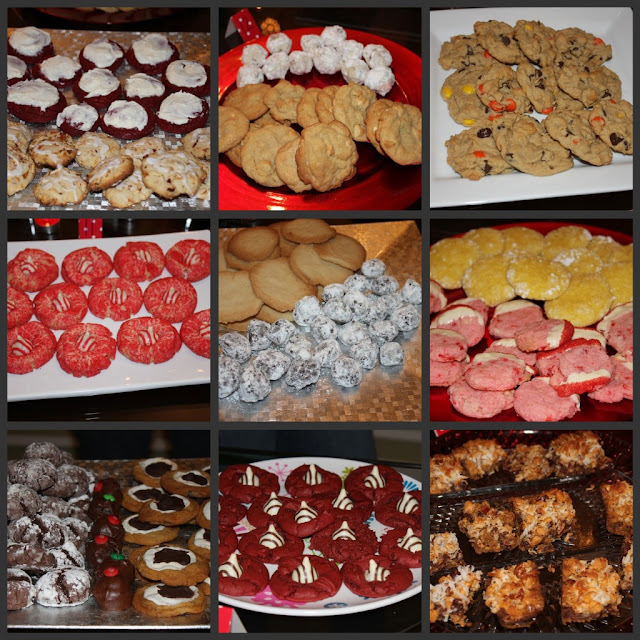 Set up a table for all of the cookies. I had extra plates available for guests if they didn't bring one. I numbered the cookies so that when guests were voting, they just wrote the number. I made sure to include plastic knives at each table for guests to cut the cookies if they didn't want to take the whole thing. 9. 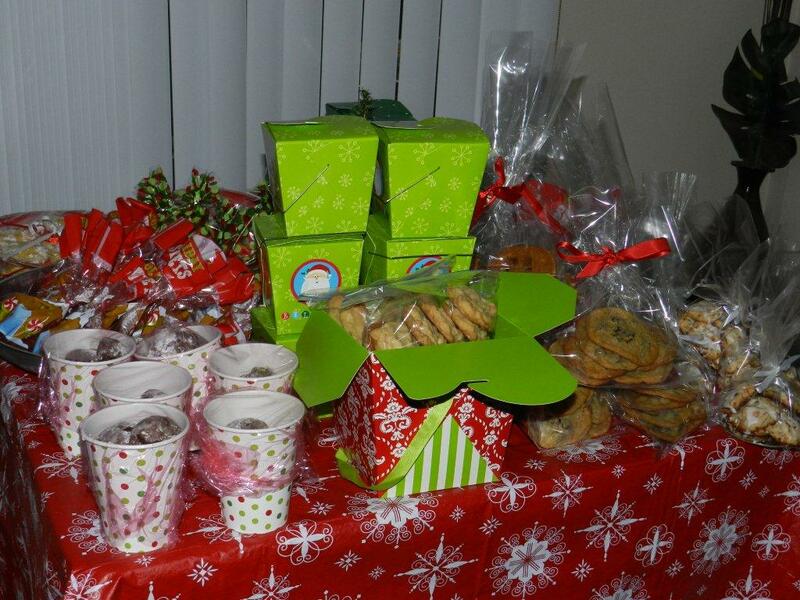 Have another table set up for guests to place their packaged cookies. 10. 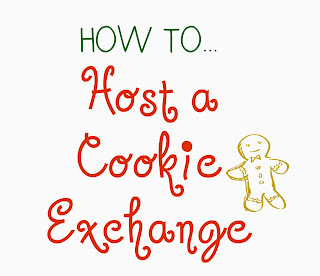 Have guests vote as they are tasting the cookies and mingling (make sure to have pens). About half way through, tally the votes. Announce the winners. I have little gifts for the winners (bottle of wine, holiday oven mitt & spatula, candles). 11. After the winners are announced, call everyone around the table with the packaged cookies. IT'S TIME TO SWAP! I had guests draw numbers to see who goes first. The guest with #1 went first and grabbed the cookies she wanted, then #2 and so on. We did this until there weren't any cookies left. I provided reusable holiday bags for guests to take their cookies home in. That's it. It's the perfect way to kick off the holiday season....great friends and sweet treats! Last month, I made these Cinnamon Bun Rice Krispie Treats. I had no idea that there were different types of marshmallows out there until I came across the cinnamon bun kind. Then, I heard there was pumpkin spice marshmallows. I love anything pumpkin so I immediately was on the hunt for the marshmallows. I ended up finding them at WalMart. I followed the same recipe that is on the box for original rice krispie treats, but used 5 cups of krispies instead of 6. Although both recipes were delicious, I actually enjoyed the cinnamon bun krispies a little bit more than the pumpkin spice. Enjoy! This little creation was inspired by a pin on Pinterest. It was a last minute craft, the day before Thanksgiving. 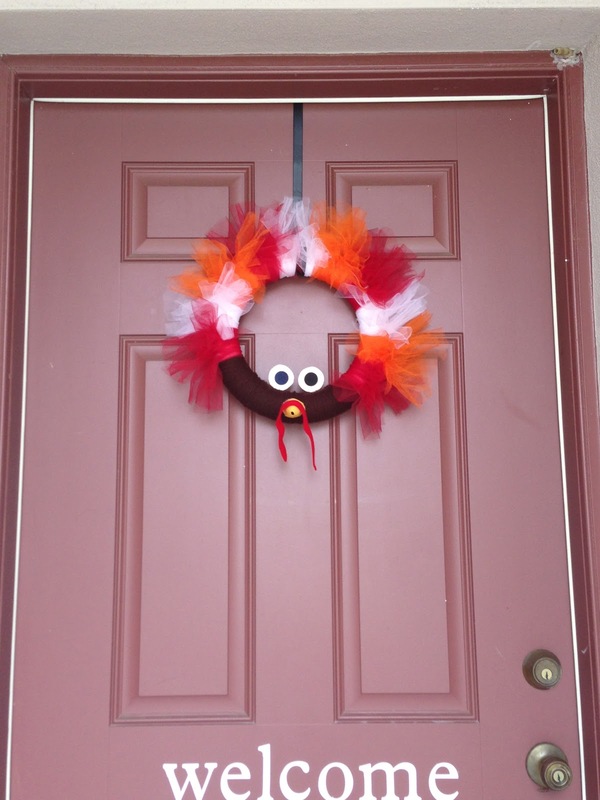 I figured/ hoped it would keep trick or treaters from ringing the doorbell or knocking on the door after we went inside. Unfortunately, just turning the lights out doesn't get the message across in our neighborhood. Paint the wood sign orange. I painted all sides. Then, I used the Sharpie paint pen to write "out of treats" and decorate the outside. To hang it, I took about 24 inches of ribbon. I folded it in the middle and hot glued it to the back of the wood. From there I tied it into a bow. After that, it was ready to go on the door. The sign worked because we didn't have any trick or treaters afterwards. One of my favorite comfort foods is grilled cheese and tomato soup. Especially on a cool fall or winter night. When I looked at the forecast a week or so ago and noticed cooler temperatures, I made sure to add this dinner to my menu. I'm still on a crock pot kick, so I searched to see if there was a soup recipe I could make in the crock pot. I decided on this one because of the amount of veggies in it and the reviews. It isn't a smooth, creamy soup due to the vegetables but it was still good. Hubs gave it a 7 out of 10 and that's pretty good because he's not a soup fan. I give it a 6 because I REALLY love creamy tomato soup. Again, a great tomato soup but if you're looking for creamy with no chunks, this is not for you. Enjoy!